Davit's Ro-Clean range of heavy-duty vertical screw pumps can be used in a wide variety of applications - such as emergency response, salvage, oil transfer and contract cleaning work. The DOP pumps are capable of pumping a wide variety of fluids from water to highly viscous oil - even when contaminated with trash. All models incorparate a cutting knife fitted to the leading edge of the screw. Davit's Ro-Clean vertical screw pumps have undergone extensive independent laboratory testing and been used in thousands of oil spills and pumping applications worldwide over the last 25 years. They can develop discharge pressures up to 13 bar (188psi) while maintaining nearly maximum flow - providing the power to push liquids through long lengths of hose. 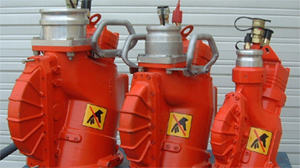 These pumps are positive displacement Archimedes design, hydraulically driven. They feature a rotating sealing plate wheeel with replaceable sleeves. The gentle action of the Ro-Clean pump does not emulsify oil and water when pumping. This means that water can be quickly separated from the recoveres oil before storage. The DUAL discharge ports enable the pumps to be configured for use in oil skimmers with top inlet and horizontal side discharge, or with bottom inlet (pump inverted) and vertical discharge - typical for product transfer. Davit's Ro-Clean pumps are available with a variety of systems to make the most of pump's capabilities including Ro-Clean annular water injection flanges that aid the pumping of high viscosity oils. Copyright ©2012 Davit Sales, Inc.